At least six people were wounded in the central town of Macerata. The suspect, named locally as Luca Traini, 28, had an Italian flag wrapped around his neck when he was detained. He had taken part in regional elections for the anti-immigration Northern League last year and reportedly made a fascist salute when he was captured. Italy votes in national elections on 4 March, with immigration one of the key issues. Mr Traini, who is from the surrounding Le Marche region, did not resist when he was detained after fleeing from his car near the town's war memorial. He is now being questioned. 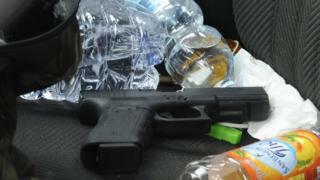 Police found a gun in his car. The shooting had begun two hours earlier at about 11:00 local time (10:00 GMT), La Repubblica website reports. The mayor had warned people to stay indoors during the incident, which saw shootings across a number of locations. The victims are being treated in hospital. At least one of them is said to be in a serious condition. Video of the moment the suspect was apprehended was published by local website, Il Resto del Carlino, showing a white bald man draped in an Italian tricolour being escorted away by police. Italian police also tweeted a photo of the moment of capture, saying one of the wounded had required surgery. Shots had been fired in the Via Spalato and Via dei Velini parts of town, two key areas in an investigation into the murder of an 18-year-old girl whose body was found dismembered and hidden in two suitcases last Wednesday. A 29-year-old Nigerian male migrant has been detained over the killing of Pamela Mastropietro. Several racist comments calling for revenge attacks were posted on the Facebook page of the victim's mother in the run up to Saturday's shootings, Ansa reports. Local reports are linking the two incidents. Right-wing politicians have been using Pamela Mastropietro's killing to promote their anti-migrant message as part of their campaign for the general election. Italian Prime Minister Paolo Gentiloni has temporarily suspended campaigning over the shootings. Opinion polls suggest a centre-right bloc, including the Northern League, Forza Italia and the far-right Brothers of Italy, will win the most seats but not a working majority. With about 28% support in the opinion polls, the anti-establishment 5-Star Movement is the most popular single party. This suggests there could be tough coalition negotiations, or even another election, after 4 March.